Early in the year, part of our activity here focuses around supporting and facilitating the Australian Wader Study Group’s annual wet-season banding expedition. After convening at the BBO, the group are now at Eighty Mile Beach for nearly two weeks of catching. So it was that I spent Friday and Saturday there, ‘helping’ to transport a late arrival from Broome airport (helping = sitting in the passenger seat and talking to the driver), and taking the chance to see hundreds of thousands of migratory birds congregating on the beach and plains while lending a hand with cannon netting. Oriental Pratincoles, other shorebirds and terns on Eighty Mile Beach. This just keeps on going, and the beach is even longer than its name suggests. Like Roebuck Bay, where the BBO sits, Eighty Mile Beach supports an amazing diversity and abundance of migratory waders that breed in the Arctic. However, there is a difference: in good years, when new growth promotes explosions of grasshoppers on the adjoining plains, the numbers of other shorebirds are dwarfed by hundreds of thousands of Oriental Pratincole. It seems that 2019 is such a year. We passed wheeling clouds of pratincoles on the plains before arriving on the beach, and once we arrived, a dark mass of resting pratincoles and other shorebirds fringed the tideline, in an almost unbroken stretch until it faded in the heat haze. To some in the group, the sight was reminiscent of their now legendary 2004 expedition. At this time, the population of Oriental Pratincole in our East Asian and Australasian Flyway was estimated at 75,000 birds. The expedition arrived at Anna Plains Station, which backs onto Eighty Mile Beach, and the team saw huge pratincole flocks feeding around camp. A rough count of 70,000 birds later, and they marvelled at having almost the entire flyway population in view. This was short-lived. Once they got to Eighty Mile Beach, there was a mass of pratincoles even denser than we saw this week, again stretching as far as they could see along the shore. 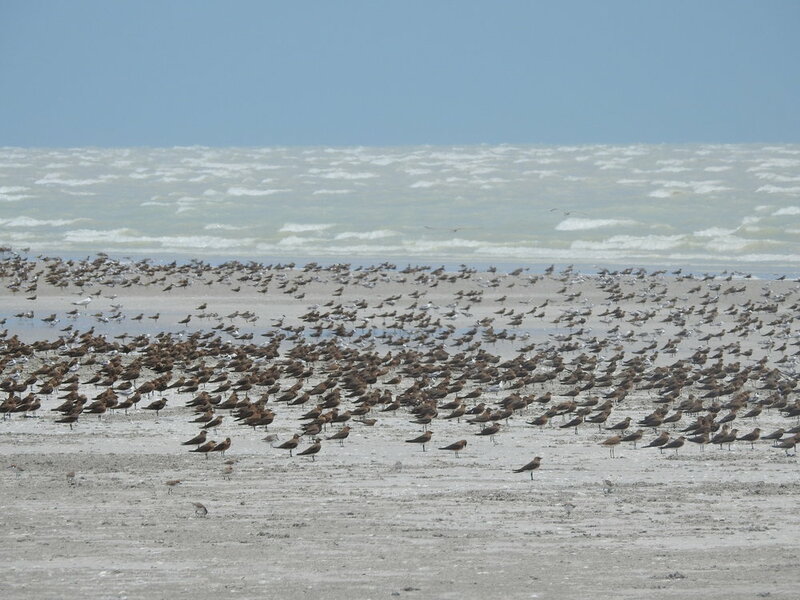 After the hard work of counting these birds, the flyway population estimate was no longer 75,000: there were 2.88 million on this beach alone. Numbers this year weren’t quite at that level, but there might be a million at the site, along with over 500,000 other shorebirds: a fantastic wildlife spectacle and a privilege to witness. A Common Redshank at Little Crab Creek. These birds are easy to identify thanks to their bright red legs. Unless they’ve spent the morning waist-deep in mud. During the time I was away (a mere night and two days) this improbable series of events unfolded: (1) a Fairy Pitta found by staff at Matso’s in town, initially unconscious after flying into a window, was released, (2) the pitta was seen foraging around such iconic Broome locations as Matso’s and Sobrane’s gallery, and (3) it was sadly found dead in a garden. A disappointing end for a bird that probably bred last year in NE Asia, before overshooting its regular wintering grounds in SE Asia and arriving in Broome. It’s an extremely unusual record – only the second from mainland Australia – made more remarkable by the revelation that another had been found dead in December. We have had less earth-shattering but nevertheless productive observations around the BBO recently. The viewing platform has been yielding fantastic views of a confiding Beach Stone-curlew, and less fantastic views of an Oriental Cuckoo, which has been seen every few days since 31st January. A few Nankeen Night-heron have been flushed around the grounds on recent mornings and evenings. 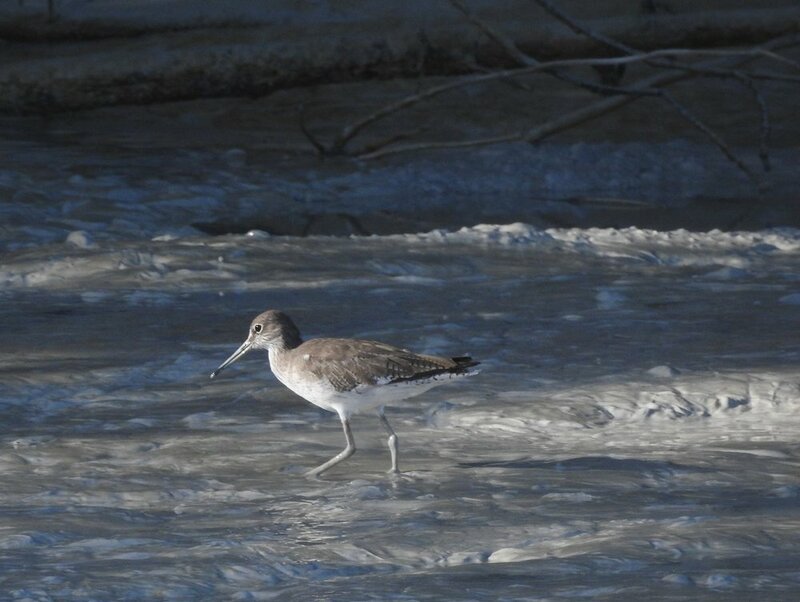 A Common Redshank has been seen at Little Crab Creek on two occasions. Breeding activity continues around the BBO: Grey Shrike-thrush and White-throated Gerygone pairs have been feeding nestlings, while Magpie-lark, Mistletoebird and Grey-crowned Babbler nests have recently fledged. There has been very little rain over the last two weeks, and the deep puddles on Crab Creek Rd are slowly drying out. We’ve recently published our tour schedule for the coming year - click over and check it out, we hope to see you later in 2019!